On September 19th, I had the honor and pleasure of chairing and presenting a panel discussion at the 2014 American Association for State and Local History (AASLH) Annual Meeting in St. Paul, Minnesota. The meeting’s theme, Greater Than the Sum of Our Parts, focused on the opportunities that arise when people come together around common goals and interests. In light of the theme’s importance, AASLH devoted a cover story to it in its magazine, History News. Among its highlights is a feature about Drayton Hall’s campaigns to preserve the Ashley River region and how, by forging partnerships, we have helped to change a once hostile culture and build support for historic preservation. For this conference, the AASLH planning committee selected session proposals that aligned with the theme of supporting partnerships and networks that help organizations preserve and present good history. My session, “Diversity in Education: Innovative Strategies and Best Practices,” illustrated how staff members at three sites in Charleston, SC, supported each other to provide quality programming and research accessibility in African-American history. Curator of Education Rikki Davenport presented “Diversity in Education: Teaching About Slavery, Innovative Strategies, and Best Practices” with (left to right) Mary Battle, Shelia Harrell-Roye, and Nichole Green. My co-presenters included Shelia Harrell-Roye, Education Outreach Coordinator, and Dr. Mary Battle, Public Historian, both from the College of Charleston’s Avery Research Center for African-American History; and Nichole Green, Research and Program Specialist, from the Smithsonian’s National Museum of African-American History and Culture. The four of us were brought together by our shared interest in African-American history, the desire to tell a more complete story of our site and its inhabitants, and our belief that strong partnerships with the proper institutions can make us all better at what we do. Our connections with each other ran deeper when we realized that we were all past participants in the Yale Public History Institute, a program that brings together graduate students, historians, and public history institutions to explore and develop ways to interpret African-American history and culture for the broader public. Nichole and I attended the summer of 2013, while Shelia and Mary attended this past summer. Perhaps our strongest bond is our shared connection to Drayton Hall. I began my tenure at Drayton Hall in the spring of 2007. At that time, I worked with Shelia, who was the Visitor Services Manager as well as an interpreter/educator. I called upon Nichole at the Old Slave Mart Museum to provide a professional development program for my staff and learned that Nichole began her public history work in Charleston as a Drayton Hall interpreter. Mary, while never a Drayton Hall staff member, conducted some of her doctoral research at Drayton Hall. Charleston, SC is a popular destination for tourists and school field trips. Charleston offers superb food, beaches, historic forts, plantations, and carriage rides. It also offers a plethora of options for visitors to learn about the history of the city and its people. The majority of historical and cultural sites in and around Charleston strive to tell a more complete story that includes the lives of enslaved people and the struggles and contributions of its African-American inhabitants. However, sites often struggle with presenting good history when they are faced with obstacles such as time constraints, limited resources, or visitors with preconceived ideas about slavery. Our objective with this panel was to provide participants with successful strategies that they could modify and apply at their own site to better present African-American history. Each of the panelists supported the objective with their own unique focus. I discussed student education programs, Shelia focused on partnerships with high school and college students, Mary presented ways to access digital documents for researching, and Nichole explained how she dealt with visitors who had little and/or erroneous knowledge of African-American history. This session offered me the opportunity to illustrate how Drayton Hall provides students with an experience that requires critical thinking, building on prior knowledge, and developing empathy while teaching content standards. All of this is done while telling the story of real people who were present at Drayton Hall. I stressed the importance of logistical, organizational, and well-prepared museum educators. A field trip can be a stressful event for teachers who have to supervise all the students, make sure they have their lunches, and ensure they are being taught accurate information. At Drayton Hall, every moment of the field trip is planned and organized from the time the school buses arrive to the time they depart. Students are always with a museum educator, all of whom hold a minimum of a bachelor’s degree and have extensive training in teaching. We often hear feedback from teachers and parents that we have the most organized field trip they have ever experienced and that our museum educators are very knowledgeable and work well with children. I explained how, with proper planning, in only a few hours, museum programs can provide students knowledge and the desire to learn more. It is my hope that all of those who attended our session will recognize that designing quality programming in African-American history is time-consuming but well worth the effort, especially when that programming has the potential to inspire children to preserve history and enable them to make connections to their own lives. As a result of our session, Shelia, Mary, Nichole, and I are making plans to keep the discussion alive. We are in the process of developing a blog for museum professionals to discuss their challenges in presenting African-American history. This format allows others to share their successes and assist their colleagues. Since our discussion began at the AASLH Annual Meeting, we will spread the word about our blog though the AASLH membership as well as organizations and universities to ensure the blog has experts in the field assisting those who need support. We are very excited about this venture and the potential it has to highlight our sites on a national level and promote the work that we all do to make history relevant. As Minnesota is the homeland of the Dakota people, AASLH collaborated with the Association of Tribal Libraries, Archives, and Museums (ATALM) to provide historical and cultural expertise of the area. Additionally, the ATALM, instead of hosting their own annual conference, merged their conference with AASLH. Their contribution to the AASLH Annual Meeting was apparent in the large number of sessions dedicated to tribal history and interpretation. AASLH certainly modeled the session theme with this wonderful collaboration that benefited both organizations. I did manage to squeeze in a few visits to area sites including the Mill City Museum, The Minnesota Science Center, and the Minnesota Historical Society. One of my favorite things about being a museum professional is getting to go through those doors that say STAFF ONLY or NO ACCESS. While my plan to be “accidently locked” in the 48,000 square foot collection storage area of the Minnesota Historical Society did not work out, I did get to see state-of-the-art collection storage and envision what we hope to have at Drayton Hall with the building of the planned interpretive center. Executive Director George W. McDaniel with keynote speaker Garrison Keillor. Drayton Hall’s Executive Director, George W. McDaniel, also attended the conference and participated in a number of sessions. He enjoyed seeing former colleagues, such as Jim Vaughan and Max van Balgooy, who used to work in the National Trust’s historic sites department, as well as Craig Tuminaro, former director of education and interpreration at Drayton Hall. 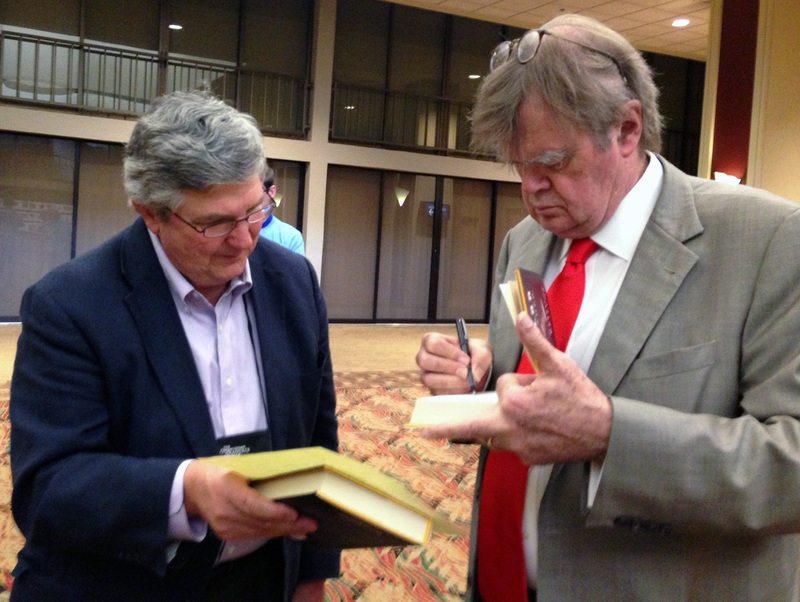 A memorable moment was his chance to talk with keynote speaker Garrison Keillor, who signed his new book for George and wished him a happy birthday. I value my work with Dayton Hall and the opportunity to serve as the Regions 5 Chair of the AASLH Award Committee. Both of these organizations have shaped my professional career in museums and help me to do my job better. Good history, that’s what AASLH and Drayton Hall are all about.